First Congregational is a popular Benzie County church for weddings, and Pastor Dinah does a number of weddings both on and off site. The Pastor's fee is $250 and it is an additional $250 for use of the church. There is no fee for active members of the church. While there are no "requirements," the pastor likes to meet with couples before the wedding so that both parties can meet each other and the service can be more personal. If a meeting is not possible in person, other options are possible. Pastor Dinah's best advice to wedding couples is "less is more" and "there are no such things as a perfect wedding." There are, however, "great wedding memories." Michigan residents should apply for a license from their local courthouse. Monday - Friday: 8:00 a.m. - noon and 1:00 p.m. - 5:00 p.m.
Our sanctuary will seat 100-120 on the main floor, with seating for 45-50 additional guest in the balcony. 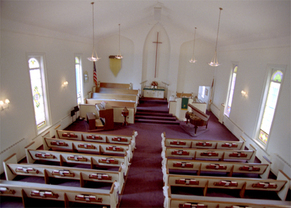 There are 18 pews, 9 on each side, with two additional pews in the back for ushers and latecomers. A dressing room for the bride and her attendants is available. Parking is available on the streets or in back of the church. Both the organ and piano are fine instruments, and there is a sound system for those that wish electronic music. We have an excellent pianist/organist named Rosemary Abbett. Her fee is generally $175 and you may contact her through the church office. Although we do not have an elevator, we do have an electric chair lift that people can use to access both levels of the church. Unfortunately, it may not accommodate everyone you have invited, so you will want to investigate that avenue. We do not have “designed” handicapped restrooms, but they are large enough to allow a wheel chair into them.